The Gate of Angels is a historical novel by the British author Penelope Fitzgerald. It is set in 1912 at a fictional Cambridge college, St Angelicus. The novel was shortlisted for the Man Booker prize. Fred Fairly, a Junior Fellow of St Angelicus ('Angels'), a fictional Cambridge college, is a physicist whose research focuses on the exciting modern field of quantum theory. As Fred cycles along the Guestingley Road in the dark, an unlit farmer's cart pulls out of a gateway into his path, causing him to crash into a stranger - a young woman by the name of Daisy Saunders. Both are knocked unconscious, and are taken in by the wife of Professor Wrayburn who lives nearby. Noting that the young woman wears a wedding ring, she incorrectly assumes that the pair are husband and wife and she puts them into the same bed to recover. On coming round, Fred immediately falls in love with Daisy, but she leaves without giving an address and he has no way of locating her. Daisy is in fact an impoverished young woman from South London, who has been working towards a nursing position at Blackfriars Hospital. She is single but wears a wedding ring to fend off unwanted male attention. At the time of the accident she was cycling with Thomas Kelly, a seedy journalist, who quickly made himself scarce. While Fred is recuperating in a nursing home, Daisy returns to Cambridge and gets a job at the local asylum. She visits Mrs Wrayburn, quickly realises that the household chores are a burden to her, and offers to take them over in return for lodging. As soon as Fred learns of her return, he proposes marriage. Daisy says that she will consider it. The driver of the farmer's cart that caused the accident has not been found and this draws the interest of Dr Matthews, Provost of St James and teller of ghost stories. It also draws the attention of the local police who open an investigation. In the ensuing trial, Fred, Daisy and Mrs Wrayburn are called as witnesses. While Daisy is in the witness box, the police unexpectedly introduce Thomas Kelly, whom she denies knowing. But Kelly, determined to cause Daisy damage, testifies that he is waiting for her to come to him at a local hotel where rooms are rented by the hour. Fred is horrified. He leaves the courtroom and waits in a nearby cafe for three hours until Kelly emerges. When he does, Fred knocks him unconscious. Following the trial, Daisy loses her job. She responds indignantly to Fred's questioning and their relationship appears to be at an end. Daisy says goodbye to Mrs Wrayburn and with no job and no money walks the several miles back to the station for a train to London. After losing her way, she finds herself outside a side gate of Fred's college, St Angelicus, which mysteriously stands open for only the third time in the college's long history. She hears a cry, goes in and helps the blind master of the college who has fainted. The incident has taken only five minutes - a delay just long enough for her to run into Fred, who is returning from a physics lecture. The original inspiration for the novel had been Fitzgerald's seeing, on a bus ride to Cambridge, cows in ecstasy over willow branches broken off by strong winds, which she viewed as an instance of reason giving way to imagination. Fitzgerald's uncle, Dillwyn Knox, a classics scholar, had a loss of faith as a young man and had not wanted to confront his father, Bishop Knox, for fear of hurting his feelings. At Cambridge, he had been a member of 'The As It Were In Contradistinction Society'. Dillwyn had been a student and Fellow at King's, whose Provost at the time, M. R. James, was a medievalist, palaeographer, and author of ghost stories. As background, Fitzgerald reread C. P. Snow The Two Cultures. The central event of the book, the bicycle crash of mutual strangers who wake up after the accident in the same bed, is based on an incident reported by Burne-Jones. 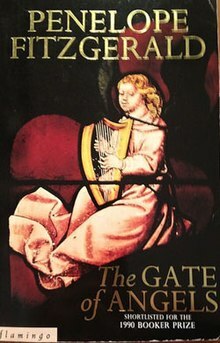 Fitzgerald has stated that The Gate of Angels is her only novel with a happy ending. Writing in 2010, Frank Kermode praised the work for its wealth of period detail, and opined that "The density of implication provided by this short novel is remarkable ... one senses a developed interest in the mysteriousness of the story, the exploitation of a new skill, which is to arrange for the story to project another story, less definite, more puzzling, than the first-hand narrative itself". Writing in The New York Times Book Review, Louis B. Jones noted that "In this novel, atoms and spooks have equal epistemological status". The novel has a chapter of its own in both Peter Wolfe's Understanding Penelope Fitzgerald and in Hermione Lee's Penelope Fitzgerald: A Life. ^ a b c "British Library Item details". primocat.bl.uk. Retrieved 29 April 2018. ^ Lee 2014, p. 352. ^ Lee 2014, pp. 359–60. ^ Lee, 2014 & 360–61. ^ Fitzgerald, Penelope (1975). Edward Burne-Jones. London: Michael Joseph. p. 230. ^ Wolfe 2004, p. 250. ^ Fried, Kerry. "High Spirits: The great Penelope Fitzgerald on poltergeists, plots, and past masters". Amazon.com. Archived from the original on 3 April 2015. Retrieved 2 December 2015. ^ Kermode, Frank (2001). The Bookshop, The Gate of Angels, The Blue Flower. London: Everyman. pp. xvi. ISBN 1-85715-247-6. ^ Jones, Louis B. (1 March 1992). "When People Collide". The New York Times Book Review. pp. 7–9. ^ Wolfe 2004, pp. 246–270. ^ Lee 2014, pp. 347–376. Lee, Hermione (2014). "The Gate of Angels". Penelope Fitzgerald: A Life. Alfred A. Knopf. Wolfe, Peter (2004). "Driving Toward Modernity". Understanding Penelope Fitzgerald. University of South Carolina Press.